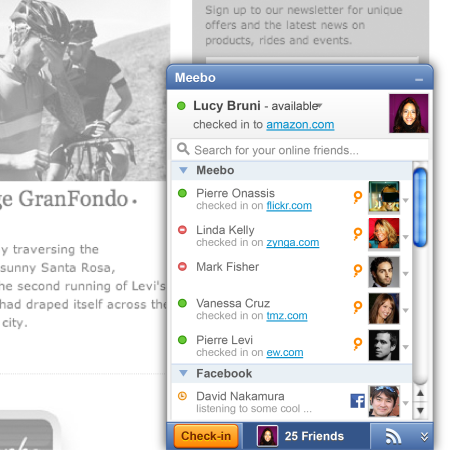 You can “check in” to locations in the real world with your phone; now Meebo wants to bring the same idea to the web. The company, which offers a sharing toolbar that lets users connect to social networks while they surf, is launching a new version that allows them to check in to any site that offers the Meebo bar, and also allows them to follow other users and see what websites they are visiting. Available as a browser extension as of Tuesday, the company said the new features will be rolled out to all sites using the toolbar by mid-December. Meebo founder and CEO Seth Sternberg says the company heard from users that many wanted to know what sites their friends were visiting, but didn’t necessarily get that kind of information from Facebook. “On Facebook, they can see what sites their friends were looking at last night, but not the sites they’re on right now,” he said. So the startup decided to build the ability to “check in” and tell others where you are as you surf, as well as a “follow” function (following another user means that that you get to see their check-ins at the various sites they visit, if they choose to share them). While on a site with the toolbar, users can click and check in at the site, and can also see any of their friends who have also checked in there, and — if they choose to enable it — can share that information with Facebook or Twitter. Sternberg says that after a certain number of visits, users can become VIPs on specific sites, which allows websites to offer them discounts, in the same way some retailers using Foursquare or Facebook Places offer return visitors deals on merchandise. Meebo will also be offering sites that don’t use the toolbar a “check in” button for their pages. Meebo has plenty of users who already make use of its cross-platform IM service and web-based messaging, but will users take to another service that wants them to check in somewhere and follow people, even if they can share that status easily with Facebook and other networks they already use? Sternberg says the optimistic view of a recent Pew survey — which showed that few people use location-sharing services — is there is still plenty of room to convince them to do so. 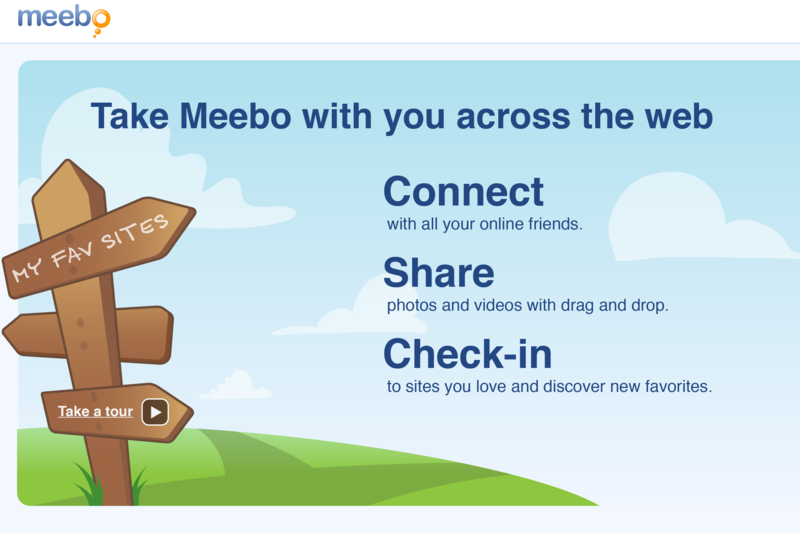 “Check-ins haven’t been done in any kind of meaningful way on the web,” the Meebo founder said. “We think we can truly drive new social discovery through these features.” Sternberg says Meebo reaches about 190 million unique visitors a month via the more than 8,000 websites that run its toolbar, and almost half those users are in the U.S., which means the company reaches about a third of U.S. Internet users. How many of them want to check in to the sites they are visiting — and share the news that they are doing so with others — remains to be seen. Disclosure: Meebo is backed by True Ventures, a venture capital firm that is an investor in the parent company of this blog, Giga Omni Media. Om Malik, founder of Giga Omni Media, is also a venture partner at True. Just bookmarked this site. Useful information. Stumbleupon is actually the first instance of this concept. Yes, that’s a good point — I should have mentioned them in the post. Much of what Meebo is trying to do is similar to what Stumbleupon offers, although there isn’t the content-sharing aspect. I have a video interview with Meebo’s CEO, where he talks about this: http://scobleizer.com/2010/11/15/first-look-meebo-channels-foursquare-with-web-wide-checkin/ Feel free to embed the video here, if you’d like!